Well, we have some bad news, folks. Tonight’s recommended show was canceled. However, the band is so fun, we’re going to post about them anyway and let you know if their show gets rescheduled. 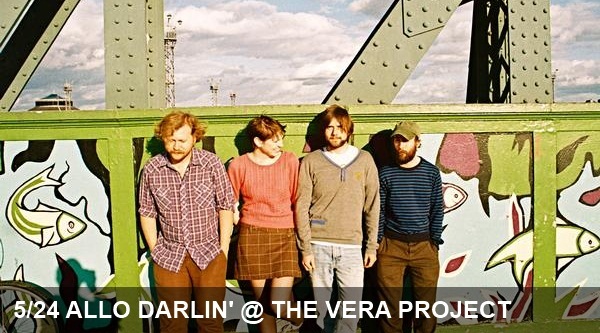 They’re a band that’s been on heavy rotation on our iPods – London-based Allo Darlin’ was supposed to be headlining at The Vera Project. First of all, their name is just really fun to say with a faux British accent (“allo darlin’!, allo darlin’!” – you know you want to try it.) Second, their smooth blend of surf rock and twee pop is perfect for the increasingly pleasant weather. Frontwoman Elizabeth Morris has an easy-on-the-ears, breathy voice, and when backed by strumming ukelele, bouncy bass lines and tambourine, you’ll feel like you just turned on your own personal beach blanket bingo party. The poor band was held up because of delays in visas, unfortunately. We’ll keep our eyes peeled to see if this show is rescheduled.